Saturday 7 April saw several members of the TPM board join supporters of the Historic Aircraft Collection at Duxford to hear Guy Black, HAC’s Engineering Director, give a presentation on the restoration of his de Havilland DH9. The packed event, the final such talk from this year’s HAC at Home series, also gave us the opportunity to welcome Guy and Janice Black to The People’s Mosquito Club and present their honorary lifetime memberships. In addition to hearing about Guy’s quest to rescue the DH9 remains from India, returning the airframe to the UK and the painstaking process of restoring the aircraft to today’s original airworthy status, attendees heard Guy introduce his next challenge: building the first Mosquito in the UK for more than 75 years ­- for us! 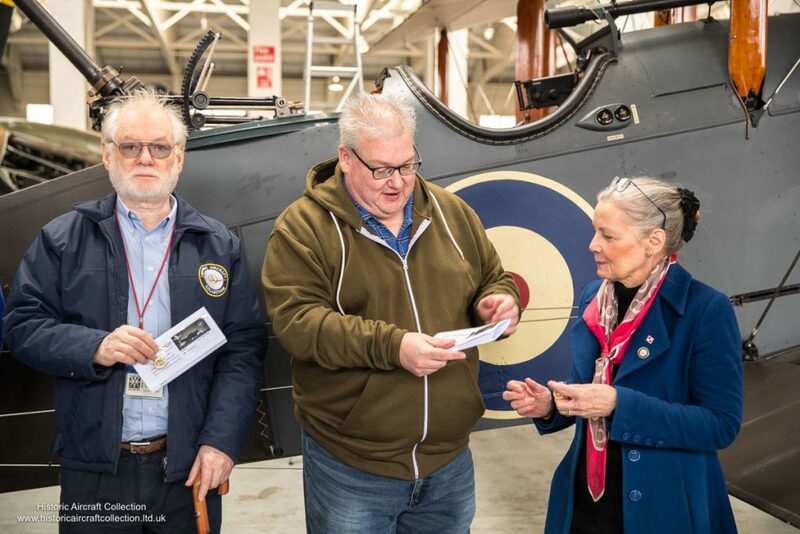 Following the presentation of the memberships to Guy and Janice, TPM board member were treated to the chance to explore HAC’s collection in Hangar 3. We hope to bring you more exciting news as we agree the first stages of our project with Retrotec in the coming days. In the meantime, you can help bring a UK-built Mosquito one step closer by supporting our project. Thanks to our verified charitably status, you can donate direct to the project through Facebook, or follow this link to be taken to our Donate page. On the website the prices of the items is not stated . Also there is not a click to purchase . Thanks for highlighting the issue – i’ll forward that on to our IT/Commercial director. There’s obviously an issue with the online store as that information is usually clearly shown. Excellent ! Well done, everybody. Retrotec are the best possible choice.